Dangerous Deceptions Book 3. A lady in hiding, a rake reforming – and a traitor at large. Theo Quenten, the new Viscount Northam, should be happy. 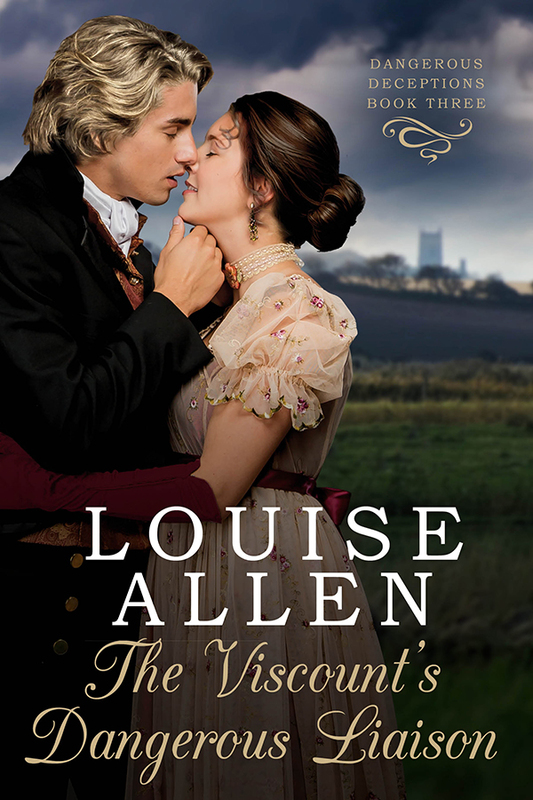 He’s wealthy, privileged and newly betrothed – even if it is to a lady he hardly knows. Staying with his friend Perry, Lord Manners on the North Norfolk coast will blow away his discontent and restore his sense of proportion, he thinks. But Theo walks into a tangle of danger and deceit. He has his dates wrong, Perry isn’t home and there’s a young lady on the run hiding there instead. As Theo becomes enmeshed with smugglers, murderous attacks on the curate, mysterious tombs and French gold he realises he is falling for fugitive Laura Darke. And that’s impossible – a gentleman does not jilt a lady he had only just proposed to. Somehow Theo, aided by old friends and new, is going to have to identify a traitor and salvage his own honour while convincing the rebellious Miss Darke that he really is the man for her. Theo Quenten, Viscount Northam, opened one eye, closed it again and contemplated death, either his own or that of the person currently working on his brain with a pickaxe. Someone was moving stealthily about his bedchamber. He hoped it was his own chamber, because the way he felt, if it belonged to a lady, he could not have put up much of a performance the night before, let alone recall her name now. Then he recalled with a mental jolt that deliciously wicked ladies and their more professional sisters, were out of bounds now. His birthday. That was what had caused the torture that was resolving itself into an almighty hangover. He was twenty six, he’d been Lord Northam for thirteen months, and had celebrated last night with the determination to put a year of sober, responsible living, and what it had just led to, behind him. For a few hours he’d wanted the old hedonistic, spendthrift existence he had enjoyed before, when the title had been a distant prospect and he had floated through life, borne aloft by his own optimistic nature and his indulgent uncle’s money, with his father’s poor health the only blight. Then his uncle was murdered, his father survived just a month as Viscount Northam, and Theo had been catapulted into what should have been wealth and responsibility and was in fact the horror of being a prime suspect for homicide. He shuddered at the memory and opened both eyes with a wince and an oath, muffled by a mouthful of bedclothes. Some idiot had drawn the drapes back. ‘My lord?’ That was Pitkin, his exceedingly nervous valet, which meant he was, at least, in his own bed. ‘Devil of a hangover,’ Theo muttered. ‘Give it here.’ Theo lurched up from the pillows, took the glass held out to him and gulped the contents, eyes closed, trying not to breathe. Only the Devil knew what Cook put in her corpse revivers, but they worked after a few moments of anguish. Pitkin tiptoed out so softly that it was as distracting as a troop of cavalry passing through – a considerable achievement for someone so slight and short. Theo opened both eyes and wondered whether today was the day when he finally lost patience and gave the man his notice, even though he was competent, hard-working, had good taste and was discreet. Flynn had found him Pitkin as a favour to Jared, Viscount Ravenlaw, best friend of Calderbrook and the third husband of Theo’s aunt-by-marriage, Guin. Viscounts needed proper valets, Jared had said. Firmly. Theo decided to restrain his impatience for another day. He owed them all for exposing the true murderer of his uncle and besides, it didn’t do to upset Flynn. Or Jared, come to that. Pitkin sidled in with the coffee, put it down and then fled to the dressing room. Theo sipped and waited for his head to reconnect to his spine. Either he was out of practice at carousing, or he was getting old, because the evening had been nowhere near as enjoyable as those he nostalgically recalled. The Season was in full swing, the weather was balmy and the Marriage Mart had opened its arms wide to a young viscount unencumbered by debt and with a reputation for wildness now, apparently, behind him. And he knew that what was expected of him was to make the appropriate marriage to a well-bred virgin with good child-bearing hips and a hefty dowry. He was trying hard to do this viscount business right, so he had. Or, at least, he had identified the well-bred virgin – without, naturally, inspecting her hips too closely – and had put the question the day before. Her father, the Earl of Prestwich, had been delighted at the prospect of acquiring Theo as a son-in-law. The bride, Lady Penelope Haddon, had seemed less rapturous, but perhaps that was either her strict upbringing or a naturally bland personality. He did not know her well enough to tell. The explanation for this seemed more than reasonable to a bridegroom who was not exactly desperate to get to the altar: she was assisting her sister with her own wedding preparations and then she had promised to visit her elderly grandmother in Somerset and then, of course, there was her trousseau to assemble. Her father had pulled a long face when informed of her wishes, but to Theo surprise, he had not pressed her, nor insisted when she said that she did not want the betrothal bruited abroad yet. He had just seemed relieved to have her future settled. ‘There is such a fuss when a betrothal is announced,’ Lady Penelope had murmured. ‘And I do not want attention taken away from dear Carola. She has not made such a good match,’ she added demurely. Theo could only agree and accept what the lady wanted. So had gone out and thrown himself into his birthday celebrations with the result that he now felt queasy from both drink and looming matrimony. Almost six months before it happens, he comforted himself. And his betrothed did not appear to expect him to dance attendance on her. Probably she was welcoming the last months of freedom as much as he was. Theo consulted his returning memory. ‘Six days. But Perry won’t mind if I go down a few days early. Excellent idea, Pitkin. Well done.’ Perhaps some positive encouragement would help the valet’s nerves. ‘Pitkin, if you do not stop dithering and if-ing and but-ing and get on with fetching my shaving water then I may well have to consider whether you are suited to be my valet.’ And be damned to what Flynn will say. Theo made a Forget it gesture with one hand and got out of bed. The floor and ceiling remained in their correct alignment with each other: the day was improving. Laura caught the eggs and sat cradling them in her hands. When she had been a child the kitchen at Mannerton had been a favourite place until the widowed Lady Manners had died and Peregrine Wilshire, the very youthful Baron Manners, had been packed off to live with his maternal grandparents. When he had returned she would visit whenever she could find an excuse to come westwards along the coast from Sedgley Manor, the home of her guardian and uncle, Sir Walter Sedgley, his wife and two unmarried sons. And then, a year ago, the visits had been forbidden. It was unsuitable for Laura to visit her friend Perry, it was deemed. From the scullery Polly, the undersized maid of all work, made a noise somewhere between a snort and a laugh and carried on scouring pans. ‘A good thing the lock on my chamber door was so cheap. I never really believed that a bent hairpin would work, but Gothick novels are right after all.’ Laura felt cheered by the success of her escape. Her relatives clearly had no idea that she had the resolution or the competence to plan and carry out such a scheme – and all without having to involve any of the servants at the Manor.